Fitter Critters is a game platform designed to transform children's attitudes toward eating and nutrition, while developing the skills they need to become informed consumers capable of making better choices about their own diets. The game is played over an extended period that will typically last weeks. Each day requires a few minutes of interaction, allowing it to be easily accommodated into classroom instruction (see the accompanying unit plan for teachers). 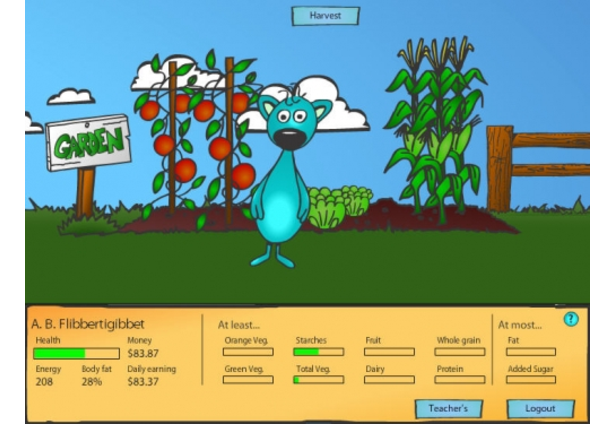 In the game children are given responsibility to make nutritional choices for a virtual pet. Meters showing daily nutritional requirements and limits fill as the player gives the critter food. Each day the meters are reset so they can be filled again. Food may be purchased at a grocer or harvested for free from a garden. Players can get creative by combining foods into recipes, which can be saved and prepared again automatically. Meals of high nutritional quality can be sold for a profit. Critters who are consistently served more nutritious diets will lead healthier and more prosperous lives. They will earn more money at work (paid daily), and win sports competitions more often. Earnings may be used to buy more food or to decorate the critter's house. By contrast, critters who frequently exceed their daily limits for fat, sugar, or calories will grow unhealthier over time. Not only will they earn less money at work, but they will be more likely to fall ill and miss an entire day's wages. They will perform poorly in sports competitions. Critters who are fed high-fat or high-sugar junk food will start to reject healthier choices with increasing frequency, creating a slippery slope where poor choices reinforce one another. The underlying theme of the game is that choices have consequences. The relationship between nutritional choices and physical health. The broad nutritional attributes of food, and the importance of whole grains and vegetables in their diets. The nutritional merits and drawbacks of specific foods items. How to read and evaluate nutrition labels critically. How to choose healthier breakfast, lunch, dinner, dessert, and snack foods. The benefits of keeping a garden and using it as a source of food. How the body uses calories, and the effects of both over-consumption and under-consumption. The effects of exercise on health, and how an active lifestyle affects daily caloric needs. Use the restaurant to share the meals they've invented with all Fitter Critters players. Grow more crops in their gardens and assume greater responsibility for their care. Pair their critters up with other players' critters in sports competitions. Build additions to their houses, and purchase more functional items with which to decorate. Visit other players' virtual houses to see how they've customized them. Personalize their critters and select from a range of character models. These efforts are all geared toward fostering sustained engagement with a worthwhile educational experience. Ultimately, Fitter Critters is a vivid demonstration how games can be used to effect positive change in people. Comments for this submission are closed. View the software in JohnF_cp's portfolio to continue the conversation.